Through this website, we hope to engage new audiences and educate visitors about the historic legacies of Japantowns, or Nihonmachis, across the state. We introduce you to the vibrant communities of the three remaining Japantowns in California and the results of Preserving California's Japantowns, the first statewide project to document historic resources of pre-World War II Japantowns. Explore former boarding houses, fish stores, florists, churches and other sites that made up pre-WWII Nihonmachis. Although hidden to most passersby, hundreds of places across California still hold the stories of pre-war Japantowns that were built by Issei and Nisei, then devastated by wartime incarceration. In 2006-2007, Preserving California's Japantowns completed reconnaissance level surveys in nearly fifty communities from San Diego to Marysville that begin to answer the questions: "Where were California's many other Japantowns? And what remains of them?" Japantowns selected for this survey met criteria developed with our expert advisory committee, including the size of the community, geographic distribution, the presence of a critical mass of community institutions and a range of commercial activities, and finally, the known presence of historic resources that could catalyze energies toward preservation and interpretation. We chose to focus on the shared spaces of Japantown daily life, businesses, services, community organizations, religious and recreational spaces. Even leaving out the residential listings, this represented an enormous number of sites to be explored. While we expected to find some traces of the vibrant Nihonmachis that suffered such violent disruption during and after WWII, we're thrilled that the results of our historic resource surveys are far more extensive than we had even hoped. We have discovered hundreds of places across the state with historic resources that can reweave Japanese American history back into the communities they helped to build. Preserving California's Japantowns' survey is shared on this website through selected community profiles and a database that can be searched by region, community, historic use of a property and its status at the time of the survey. These newly discovered resources can broaden public awareness and encourage the preservation of places and memories significant to historic Japanese American communities across California. We encourage public agencies and heritage organizations to use this survey as they consider options for local planning so that their work can encompass stewardship and interpretation of their community's past. The term "Japantown" encompasses a wide range of communities, from large Nihonmachi in metropolitan areas that include numerous community institutions and businesses to rural Japantowns with relatively small populations and more limited community facilities. Historically, most Nihonmachi included one or more of the following institutions and services: community halls, language schools, bathhouses, Buddhist temples, Christian churches, markets, nurseries, and other Nihonmachi businesses. "In Japantown, we felt comfortable," said Joe Tondo in Generations: A Japanese American Community Portrait (2000: 15). 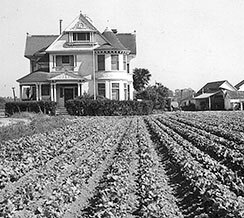 All across California, there were once urban or suburban Japantowns like Sacramento and San Mateo, agricultural communities like Cortez and Guadalupe where Japanese became farm laborers or truck farmers, coastal towns like Monterey and Terminal Island where the Issei worked as fishermen or in fishing canneries, and towns on the delta like Walnut Grove and Isleton, where Japanese went in search of work on the Central Pacific Railroad. PHOTOS ABOVE: Hirahara House - Watsonville; Ginza Beauty Shop, Ohori Sewing School - San Diego. We invite you to explore Japantowns in San Francisco, San Jose and Los Angeles' Little Tokyo through interactive maps that highlight the historic and contemporary features of these vibrant communities. The three Japantowns in San Francisco, San Jose, and Los Angeles are the last of the major Japanese communities to survive the demolition during urban renewal in the 1950’s and 1960’s and the forced evacuation and incarceration of Japanese Americans in concentration camps during World War II. They provide a true sense of place for Japanese Americans today. 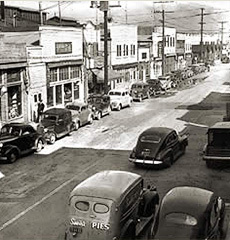 Preserving California's Japantowns has been gathering Nisei memories of pre-WWII Japantowns. ››View our "Nisei Story" prototype with Leo Saito of Oakland. 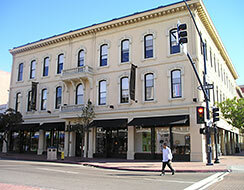 Preserving California's Japantowns supports local efforts to preserve historic Japantown sites. Read more here. To assist in documenting and preserving Japanese American community history, PCJ identifies resources and helpful links.